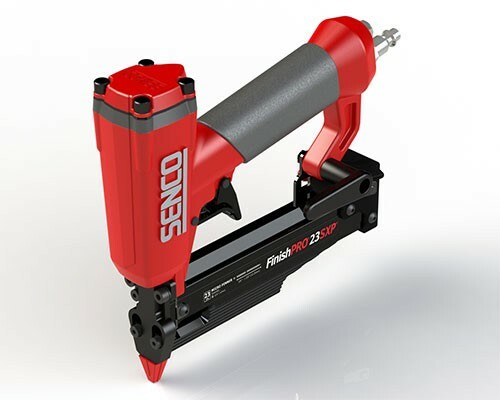 Senco has announced that they are coming out with all new 1-3/8-inch and 2-inch 23-gauge pin nailers (aka micro pinners). These new pinners stray from the typical Senco grey and black look, but are said to offer better ergonomics thanks to an angled pistol grip. CINCINNATI (September 9, 2013) – Senco is introducing two new 23 gauge pneumatic micro pinners, the FinishPRO®23SXP and the FinishPRO®23LXP. An expanded fastener range for greater project versatility. The tools fire headless pins ranging from ½” up to 2” long, depending on the model. Quick and easy loading. The addition of a self-adjusting magazine eliminates the need to manually reset the tool for different fastener lengths. A more powerful motor. Complete drives into hard woods like oak and red maple are no problem for the FinishPRO’s industrial strength motor. Both tools deliver 70 – 120 PSI of force, with no worry over splitting or touch-ups. Ergonomic angled pistol grip. Senco’s new headless pinners are the first in the category to feature an angled pistol grip design to reduce wrist fatigue and increase maneuverability in tight spaces instead of the standard 90-degree straight handle grip seen on competitor models. Other helpful features contribute to the FinishPRO 23’s flawless performance and reliable control. The tool’s ultra-narrow nosepiece provides convenient access into corners and tight spaces. A 4-point alignment guide is integrated into the rubber tip no-mar pad, which tapers down to the contact point, providing a clear line of sight for precision pin placement. A double trigger safety lock prevents accidental misfiring while the auto lock-out feature prevents dry-firing when the magazine is empty. A rear exhaust with an embedded muffler reduces noise and directs air and dust away from the work surface. The tools are constructed with lightweight aluminum housing, a hardened alloy steel driver, and a metal magazine for durability. Both models are equipped with a reversible belt hook for easy carrying, onboard storage for the no-mar pads, and a jam clearing wrench. Both come with a carrying case. Applications include: light wood assembly, molding and decorative trim work, dowel and joint pinning, mirror and picture frame assembly, lightweight paneling, external softwood trim, rattan furniture, glazing strips, window beading, display and sign work. The FinishPRO 23SXP and LXP will be available this fall. It looks like the design of the new FinishPro23SXP and 23LXP is more similar to that of the popular Grex pinners, and they are popular for a reason; so it is not surprising Senco wants to match and/or beat their competition. At $159 and $229 they are, for one, beating them in price. If you are doing any kind of small work with wood or trim, a micro pinner is the only way to go. Just watch your finger placement, I have been bitten more than once by a deflected pin-nail.